In a ceremony scheduled for August 24, Oxford College will hold the official opening of its new library and academic commons, formally celebrating the end of a year-long construction project that resulted in a facility with square footage, usability, and technology capabilities that are greatly increased over the former library. "We are delighted with the results," says Oxford College Dean Stephen H. Bowen. "After years of careful planning Oxford College has a library and academic commons that can fully support our faculty and students across the curriculum. This is a state-of-the-art facility that provides Oxford with an essential hub of learning." 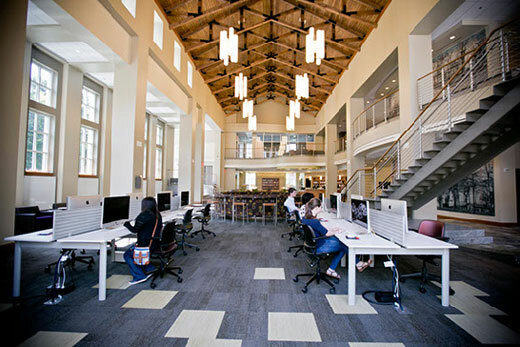 "The Oxford library is a breathtaking example of a modern, thoughtfully designed library space that will encourage intellectual exploration, learning and collaboration for many years to come," adds Rich Mendola, senior vice provost of library services and digital scholarship and enterprise chief information officer at Emory University. The new library is nearly one-third larger than the former facility, which was completed in 1970. Over the course of construction, the original two-story structure was completely gutted and 10,000 square feet added to the front, or east side, of the structure. With this addition, the library more closely addresses the college quad. Both the design and finishes of the exterior were selected to co-exist aesthetically with the two historic structures on either side: Phi Gamma Hall on the north side, built in 1851, and the Oxford College Chapel on the south side, built in 1875. Says Charles Forrest, director of facilities for the Emory Libraries and consultant to the project, "The library is spectacular. It’s going to be a campus asset and a center of activity, even a destination event space for Oxford." Visitors enter from the quad into the academic commons, located in the new addition. The 30-foot, wood-clad cathedral ceiling features trusses constructed in Georgia of native wood and custom-made glass chandeliers. Large windows provide maximum natural light and an atmosphere of airy spaciousness. 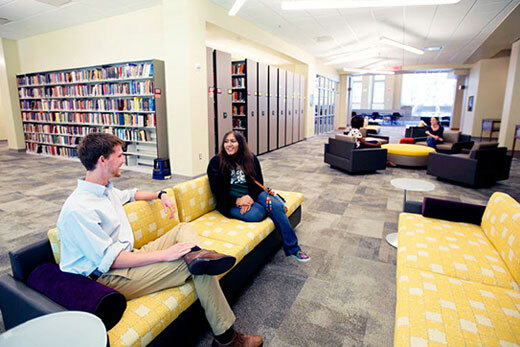 Furnishings in the academic commons provide for individual study or group collaboration. 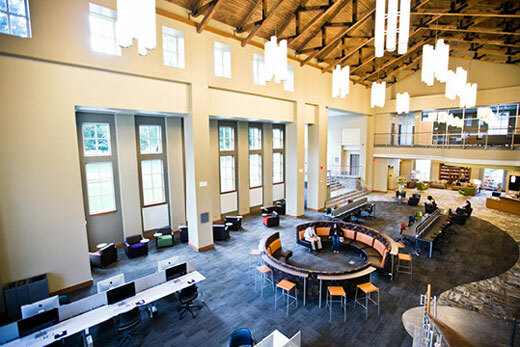 On the first floor, in addition to the academic commons, there is a special-collections reading room, a café and vending area, exhibit gallery, two research consultation rooms, and a catering kitchen to support receptions and other college functions. On the north side of the first floor is the entrance to a patio designed to serve as an outdoor classroom or to provide additional seating and study space. The second floor features a spacious balcony with seating, overlooking the academic commons. On this level are also two large, flexible, and technology-enriched classrooms; five tutor-support rooms and four group-study rooms with large-screen displays and laptop connections. The group-study rooms include PC workstations. Both levels include seating and study areas with large windows that provide natural light and wide views of the college’s woods to the west of the building. Wireless technology is available throughout the building, including the outdoor classroom. Interactive whiteboards are available in the classrooms. The academic commons has 24 iMac computers which can be booted as PCs, and workstations on both floors provide connections for users bringing their own laptops. The print collection includes more than 89,000 volumes. These are arranged on compact shelving installed on both floors, which provides optimum use of the building’s floor space. MacBook Pro laptops and iPads are available for checkout to Oxford students, faculty, and staff. Also available for checkout are more than 1,300 DVDs, print bestsellers, e-books, and digital devices including cameras, video equipment, and digital recorders. Popular magazines and newspapers are available for in-house use in a spacious reading area in the academic commons. Through the library’s web page, users can access the entire Emory University library collection, as well as online databases, journals, and other digital resources. The Fran Elizer Exhibit Gallery on the first floor will be scheduled with regular displays of historical and artistic interest. 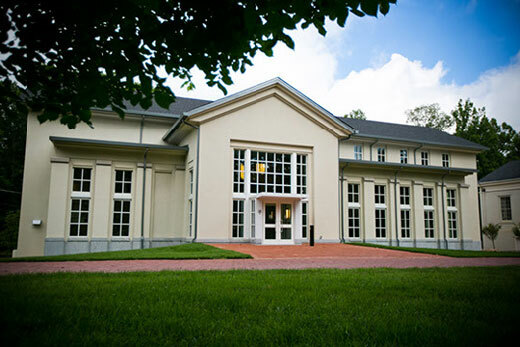 The initial exhibition will be a retrospective on the history of the Emory Libraries, opening concurrently with the grand-opening celebration. 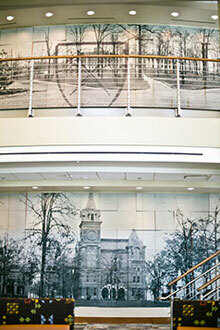 On the first- and second-floor walls of the academic commons, there is a permanent visual — a large, historic photographic panorama of the Oxford quad. Printed on multiple tiles set at random vertical angles, perspective of the panorama changes depending on the viewer’s proximity. Subtly overlaying the display is a listing of the new library’s major donors. The new facility was designed by architectural firm Collins Cooper Carusi. The construction firm for the project was Brasfield & Gorrie. The public is invited to the grand opening, which will take place at 3:30 pm on Saturday, August 24, inside the new library. Representatives from Emory University, local dignitaries, and Oxford College alumni will be on hand to join Oxford faculty, staff, and students in celebrating this important milestone.